Philippine-Japan defense ties have been in the headlines quite a bit this week, in part due to a few key developments in the maritime security realm. Though these are just a couple of manifestations of a longstanding and wide-ranging defense partnership, they nonetheless are worth emphasizing because they constitute a boost for Manila’s limited military capabilities as well as a gain for the bilateral defense relationship between the two countries that has broader regional implications as well. There are various manifestations of this defense relationship. Some of them are continuations of older lines of effort, like the Maritime Safety Capability Improvement Project (MSCIP), which has seen Japan offer deliveries of equipment, training, and other forms of cooperation. Others are newer developments, such as Japan’s delivery of used Beechcraft King Air TC-90 planes, which was the first instance of Japan transferring excess defense equipment to another county free of charge following ongoing changes in its domestic laws (See: “Why Japan’s New Military Aircraft Gift to the Philippines Matters”). This week was a rather active one for defense ties between the two sides that featured both the old and the new and reinforced the strategic importance of defense cooperation more generally. First, on March 26, the Manila received three more Beechcraft King Air TC-90 planes from Tokyo, completing the initial landmark deal that had been forged (See: “New Military Aircraft Puts Japan-Philippines Defense Ties in the Spotlight”). Beyond its strategic importance, the TC-90s deal is important for practical purposes too because of Manila’s limited ability to even conduct regular and extensive patrols of the South China Sea with its existing capabilities. So it was little surprise that we saw Philippine defense officials highlight that more of such aircraft would facilitate such efforts in terms of added capability, even though there are lingering questions about the Duterte administration’s overall approach to the South China Sea and China’s growing assertiveness more generally (See: “Beware the New China-Philippines South China Sea Deal”). Then, on March 28, the Philippine Coast Guard commissioned two new multirole response vessels (MRRVs) from Japan. The MRRVs were part of an initial pledge to provide 10 of the vessels under Phase I of MSCIP, with three of them delivered in 2016, three of them arriving in 2017, and the remaining four expected this year. 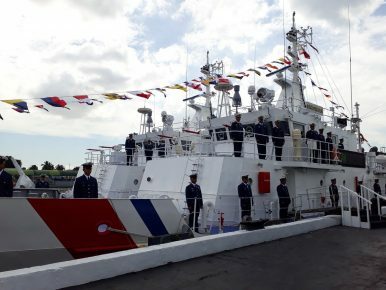 The two ships, named BRP San Agustin and BRP Cabra and given pennant numbers 4408 and 4409 respectively, were commissioned at the PCG headquarters in South Harbor, Manila. The stated use of the vessels involves a range of tasks including search and rescue, law enforcement, and counterterrorism, and the PCG has indicated that the vast majority of the missions carried out thus far by the vessels have been related to regular patrols and surveillance efforts to humanitarian assistance and disaster relief. But Philippine defense officials have also indicated previously that these vessels would be directly useful in addressing the country’s key security challenges, be it deployments in the southern Philippines to fight sea piracy or providing greater capacity for Manila to patrol its waters given Beijing’s concerning behavior. To be sure, these are just two of several lines of effort that are underway within the context of the Japan-Philippines defense relationship, and the focus on these positive developments needs to be paired with an understanding of the lingering challenges for ties, especially during the Duterte era. Nonetheless, this week was one which maritime security updates clearly reinforced the strategic significance of defense ties between the two sides.